Courtesy of the WSJ: A half-decade after killing off its hefty catalog to focus on the Web, J.C. Penney is bringing it back, armed with data showing that many of its online sales came from shoppers inspired by what they saw in print. The new, 120-page book will feature items from Penney’s home department and will be sent to select customers in March, the first time the struggling department store chain has sent out a catalog since 2010. The move highlights an oddity of the digital age. While shoppers are increasingly buying everything from shoes to sofas to cars over the Internet, they still like browsing through the decidedly low-tech artifacts of page and ink. Now, retailers are rediscovering print as a branding tool that can drive sales. According to retail consultant Kurt Salmon, 31% of shoppers have a catalog with them when they make an online purchase. The call to bring back the catalog was made by Chief Executive Myron “Mike” Ullman, who is trying to return the retailer to good health. It also was Mr. Ullman who decided during his first turn as Penney’s chief to stop publishing it. 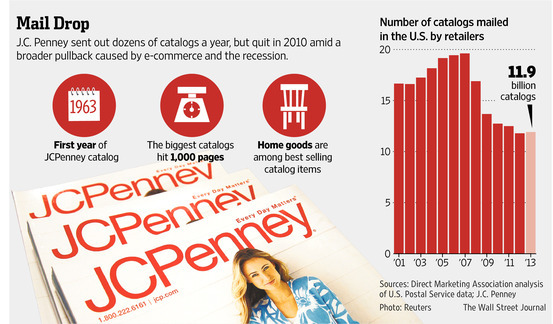 In an interview, he said he thought at the time that catalog shoppers would migrate online. But the company eventually learned that a lot of what they thought were online sales were actually catalog shoppers using the website to place their orders. “We lost a lot of customers,” Mr. Ullman said.